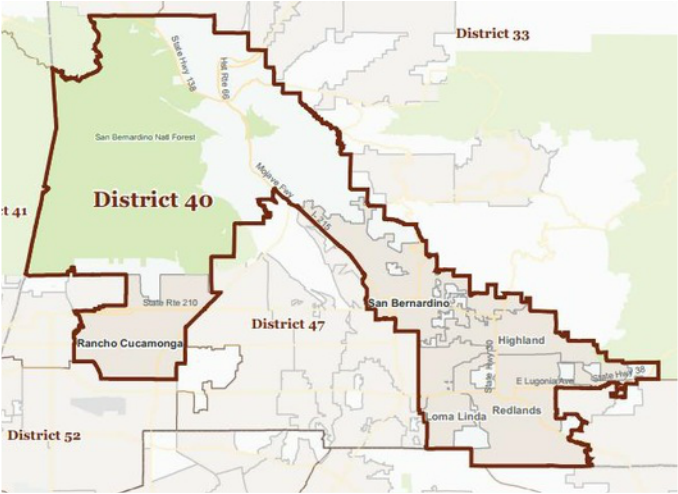 Republican Marc Steinorth currently represents Assembly District 40 and will not be termed out until 2026. Steinorth is expected to face a strong Democratic challenger in 2016. This seat is a priority for Democrats to pick up due to a slight voter registration advantage. City Councilman Marc Steinorth has served the City of Rancho Cucamonga since 2012. As a member of the City Council, Marc is the Vice Chairman of the League of California Cities Inland Region Legislative Task Force, a group which aims to advocate for policy decisions in Sacramento that positively impact the interests of local residents and businesses. Additionally, Marc is a member of the Chamber of Commerce committee and the Technology and Communications Subcommittee, as well as the Consolidated Fire Agencies (ConFire) committee. In his time on the Council, Marc has worked to faithfully carry out prudent financial decisions that reflect good stewardship of public monies by the City, on behalf of Rancho Cucamonga taxpayers and residents. He recognizes that government must live within its means and that it has a responsibility to justify each tax dollar it spends. Doing so ensures that the necessary and valuable services and functions of the City will be readily available for the Rancho Cucamonga community now and in the future. These guiding leadership and management principles Marc has developed are drawn from his extensive experience as a successful entrepreneur and businessman. Over 16 years ago, Marc founded Atlas Buying Group, Inc, which is still in business today providing professional services to local businesses and corporations nationwide, helping them grow and create jobs. Additionally, Marc has dedicated himself to actively engaging with the community around him and volunteers his time with various local organizations including the James L. Brulte Senior Center, Our Homeless, HOA President RCV, HOA President The Courts, and the Lincoln Club of San Bernardino County. Marc was raised in a military family, as his father served as an Officer in the United States Air Force for two decades; he and his family moved around the globe in commitment to the needs of our Nation. After graduating from Ramstein American High School in West Germany, Marc was admitted to the University of Maryland at Munich before returning to Southern California, where he completed his studies and graduated with honors from the University of California, Riverside with a bachelor’s degree in Political Science. Marc has been married to his wife, Maria, for 17 years and they have two children, Madison, age 14, and Mason, Age 6.